Since 2011, Sierra Pacific Industries (SPI) has filed 6 timber harvest plans (THPs) totaling 13, 022 acres within walking distance of the Sierra Nevada's only known wolverine. That's over 20 square miles, and most of the logging would be at very high elevations from 5,600 - 8,400 feet just north of I-80. Under the guise of "forest health," SPI plans to remove some very large trees (helicopter logging is proposed on 4 of 6 sales) in an area where the wolverine relies on what little high elevation intact forest still stands today. A wolverine's home range is 70 miles; but 3 of the THPs have confirmed wolverine sightings inside the THP, and the other 3 have reported sightings nearby (adjacent to - 20 mi out). 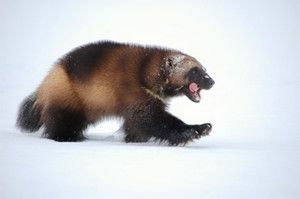 On February 1, 2013, the US Fish & Wildlife Service announced its proposal to list the wolverine under the Endangered Species Act (ESA) including the Sierra Nevada individual. The THP Tracking Center will continue to monitor private lands logging trends that threaten the wolverine. See SPI Wolverine THPs. More information is available on the THP Tracking Center website.